This is a composite of two map sheets, dated around 1985. They are based on surveys over the previous 10 - 15 years and contain a wealth of detail. Can clearly see the Horse-shoe bend here. What was known as the Black Ditch is now the Big Ditch. Is the Oak Wood still actually there? It used to be a nice walk from Rosskeen through this wood and on to Tomich road. Just noticed the High and low tide springs. What does this refer to? I know that there were springs in the sand in front of the old bullwark, you could see them bubbling through. Or does this refer to the high and low tide mark? Harry, the highest and lowest tides occur at the time of the New Moon. They're called Spring Tides and are not connected to the 'Spring' season. It's interesting that the maps show the Black Ditch as the Big Ditch. As far as I know, it's always been known locally as the Black Ditch, and that continues to today. Similarly, locals know the settlement around Newmore Primary School as 'Newmore' although maps have always marked it as Rhicullen. Your points about the Oak Wood are interesting as it is clearly marked on this map. If you take a look at the excellent aerial view at picture #503 you'll see the golf course in the foreground, the small wood to the left, and the course of the Black Ditch shown quite clearly. The Black Ditch is an almost straight line running up the left hand side of the picture. You can see that the bulk of the Oak Wood has gone and the course of Johnstone’s Ditch has been altered so that it joins the Black Ditch much nearer the 'Concrete Road'. What remains of the Oak Wood is in the bottom right of the small wood to the left of the golf course. The top left of this small wood is a conifer plantation. Traces of the old course of Johnstone’s Ditch can be seen in the edge of this plantation. The result is a single large field shown as golden yellow in the picture (probably Barley). You can also see that the buildings in this field near to the Castle Cottages have gone too. Interesting map Malcolm, I have always understood Rhicullen as being on the right as you face Newmore school from Invergordon and Newmore from the school on to Mossfield and Castle Dobie..
Liz, it's odd this use of local names. I've sometimes mentioned Rhicullen and people have wondered where it is that I'm talking about. 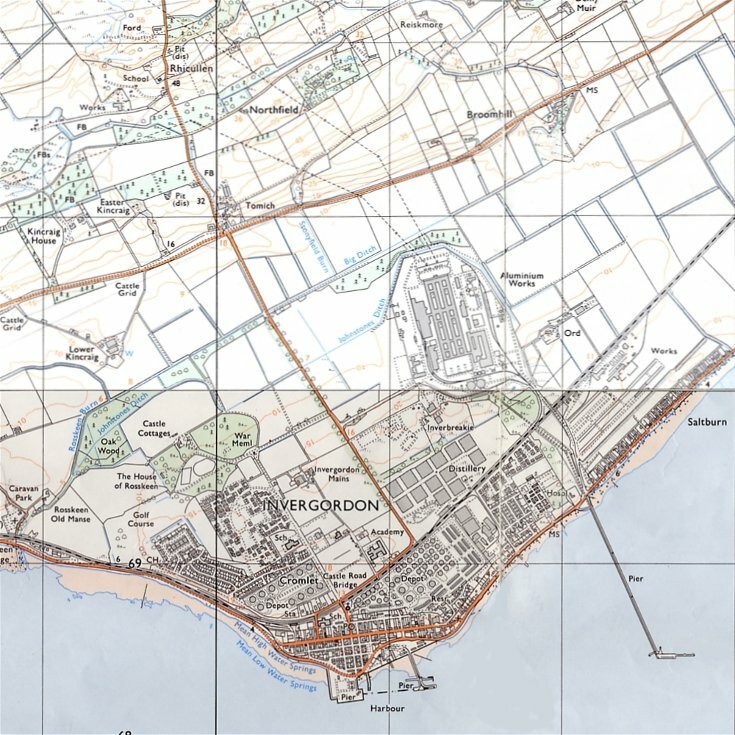 This map, if extended further north and west would show Newmore Mains and Newmore House, but nowhere is shown as 'Newmore'. Incidentally, where is Castle Dobie? Thanks Malcolm, I revisited picture #503 and see all now. At least the other wood is still there. It was always refreshing to wander through there as it was so quiet. Would have to watch out for golf balls now though. Hi Malcolm, if you go straight up the road at Tomich, past Newmore school, at the junction at the top of the road facing you there are two (?) bungalows. There used to be a row of ruined cottages and that was called Castle Dobie.